Mission Work | Brian Mickelson…. If you’ve read my friend’s post, you know that you and I are Type III witnesses in most cases. We’re not called to die for our testimonies, nor to lead large groups of people in out-of-the-ordinary ways. We’re called to share our witnesses in daily, ordinary, faithful, consistent ways. Blogging is just one way to do that. Since my last post, a number of people have contacted me for a little help on blogging. So I want to share a few “best practices” for the LDS blogger. I use WordPress for all of my blogs. It is free, easy to use, and easy to customize. 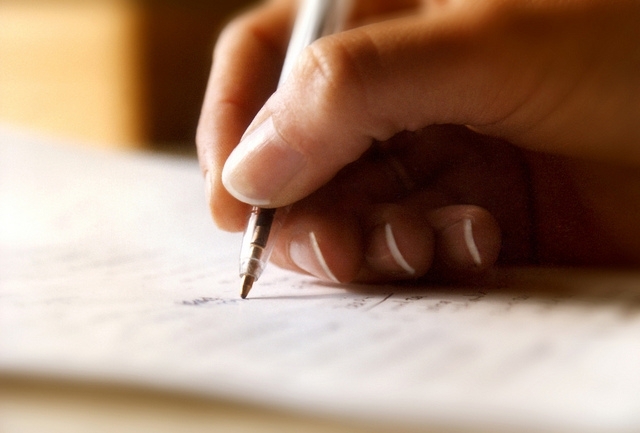 Write regularly, but don’t overwhelm yourself. I find myself writing about two to three times a week. I’ll write more some weeks, depending on time and the ideas that come to me. I use other forms of social media to help spread the blog. You can find me on Twitter, Instagram, and Pinterest. Personally, I avoid being controversial. I do a lot of research on religious topics, and I’m not afraid to share thoughts on topics that may be controversial, but I’m not here trying to stir up some argument. In fact, I won’t argue with people. I’ve never found that to be helpful. Write about things you know and love. What parts of the gospel are currently blessing you? Why? Spell things correctly. Use appropriate grammar. Don’t use all caps (that is like shouting…no one likes shouting). I know this part of blogging turns a lot of would-be bloggers off, but often we lose a little credibility when we don’t proofread and edit (but don’t look too closely at my blog…there are bound to be errors hiding all over the place). Comment on other people’s blogs. They’ll check yours out. Feel free to tell your friends, especially those curious about the Church, about your blog. Picture yourself reading the blog. 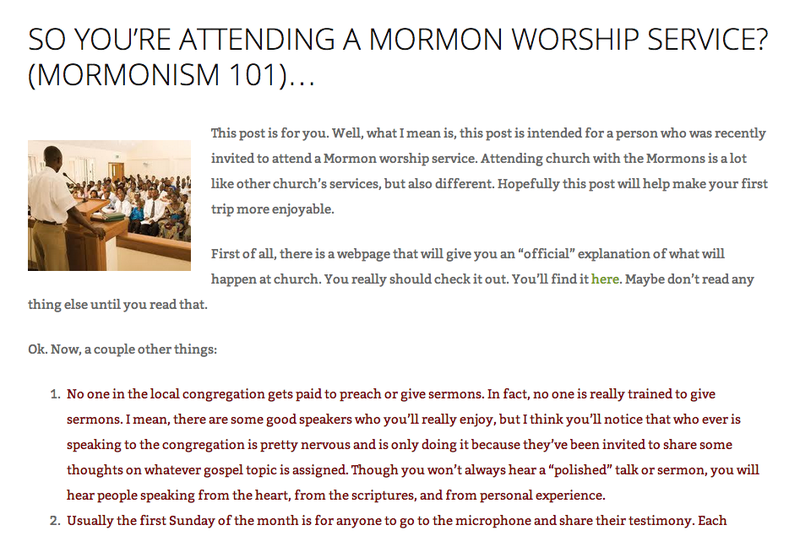 If you weren’t very familiar with Mormonism, would your post be confusing or clarifying? Remember who your audience is and write to them. Pray about what you write about. 2 Nephi 33:1 talks about the Holy Ghost carrying the inspired written word to the heart of readers. Is there a story you think Heavenly Father wants you to share? Lastly, not all aspects of your religious life should be shared on a blog. Some things are just sacred enough that they should be protected and only shared under the influence of the Holy Ghost. Be careful. Be normal. If you wouldn’t share a certain personal story with some stranger you were sitting by on a bus, don’t share it on your blog. Ok, well, there’s a list. Some of the ideas may be lame. Feel free to ignore anything you like! 🙂 Also, remember that you are under no obligation to be a blogger. There are other ways to share the gospel using social media including Facebook, Twitter, Instagram, etc. Good luck. Please feel free to shoot me any questions you have. I’ll try to answer them as soon as possible! This entry was posted in LDS, Mission Work, Mormon, Mormonism, personal life and tagged blogging, blogging basics, facebook, hastening the work of salvation, instagram, lds bloggers, lds blogs, lds.org, Mormon, mormon.org, pinterest, twitter on November 26, 2013 by BJM. Well, last Thursday, Trent Toone from the Deseret News wrote an article entitled, “Blogging Bishops: 2 Mormon Men Talk About Sharing the Gospel Online” and featured my blog, along with the blog of a currently serving bishop from Idaho. It is a great article in a series of solid articles regarding sharing the gospel online in the LDS world. I’ve noticed some interesting things since the article went online. 1. The digital version of the article has spread to many parts of the internet. When I search blogging bishops, mickelson, and gospel all together, I find that the article has been linked on Facebook, and then on all kinds of pages around the web. 2. The number of messages I’ve received has increased drastically. I mean, I really don’t get many messages here on the blog, but I get a number of messages on Facebook. Since the article on Deseret News, I’ve received a number of emails, a number of Facbook messages, and a few more messages right here. 3. The number of people “following” the blog increased more than ever. Now, more people get an email notifying them when the blog updates (you can too, if you want…). 4. People have clicked on way more links from my blog. A number of people clicked on the link to get a free copy of The Book of Mormon or have gone to Mormon.org. Awesome. Korea? Hong Kong? Russia? That’s awesome. Now, there is a reasonable chance that some of the visitors are just computers coming to the blog with no human attached, but I’ve received a surprisingly low amount of spam-comments, and a few messages from around the world. 7. There have been a number of people who have inquired about how to do a blog or improve their blog. 8. 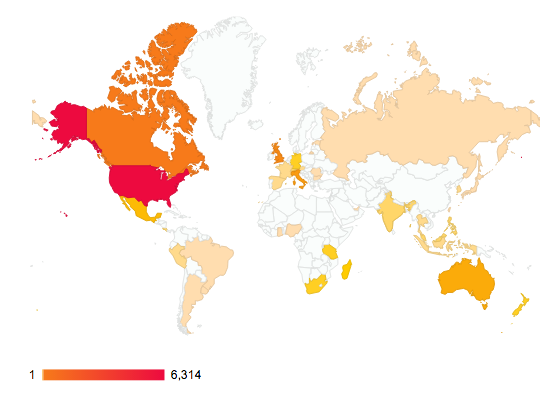 There has been an increased number of people who have shared my blog online in one way or another. Anyhow, all this is due to Trent’s great article and the power of the internet as opposed to my writing. I totally get that. But I’m thankful that more people have access to stuff that may be helpful or encouraging. This entry was posted in LDS, Mission Work, Mormon, Mormonism and tagged blogging, brian mickelson, deseret news, hasten the work of salvation, LDS, lds bloggers, lds blogs, Mormon, trent toone on November 24, 2013 by BJM.